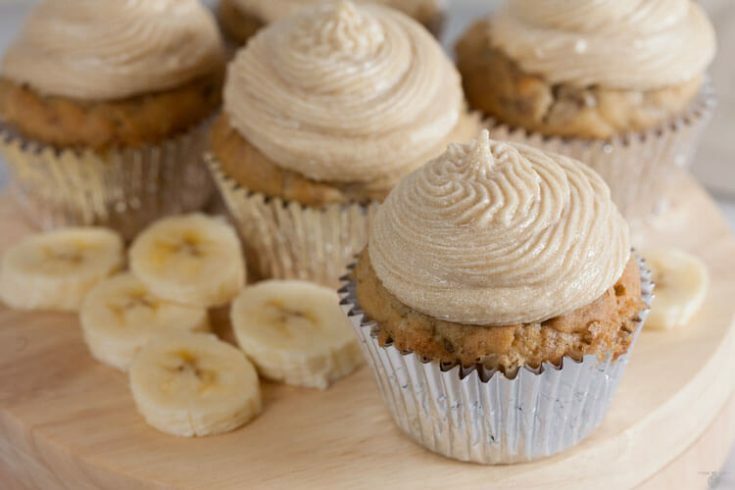 Dairy Free Banana Cupcakes with Brown Sugar Buttercream | Healthy. Delicious. 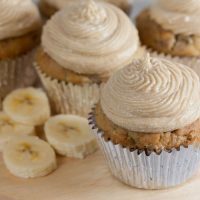 These tender banana cupcakes are made with coconut oil and cashew milk, so they’re completely dairy free. Top them with swirls of brown sugar buttercream for a crave-worthy treat! Do you ever get a craving that you just can’t shake? I’m not exaggerating when I say I’ve been craving banana cake since December. It came out of nowhere and just would. not. go. away. Of course every recipe for banana cake that I could find was incredibly rich and full of buttermilk, sour cream, and calories. Of course every recipe for banana cake that I could find was incredibly rich and full of buttermilk, sour cream, and calories. Luckily, this cold weather that we’ve been having practically necessitates having cake in the oven, so I’ve been working on a lighter version of banana cake! 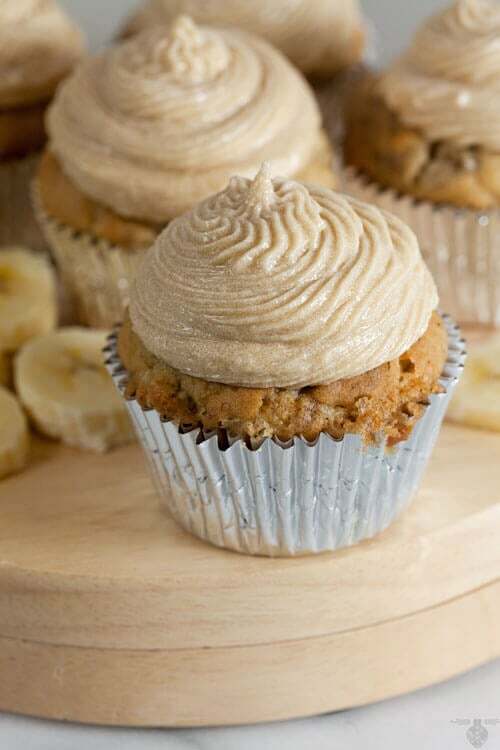 These banana cupcakes are perfectly portioned and definitely hit the spot. 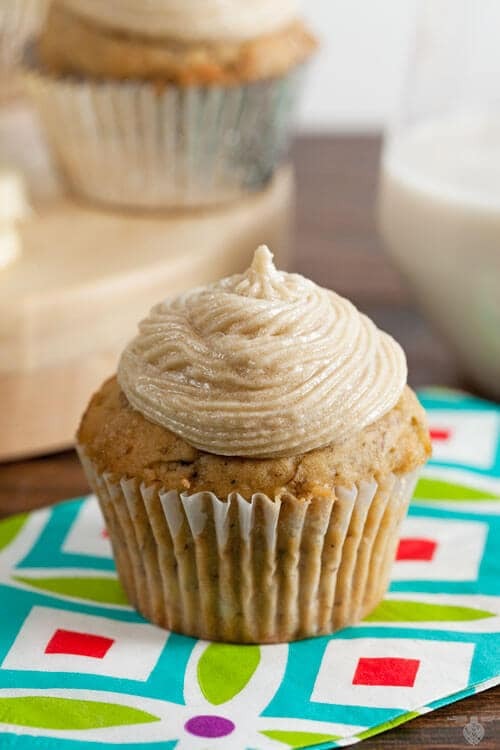 These banana cupcakes are definitely still a treat – they clock in at just under 300 calories a piece – but they’re a significant improvement over other banana cake recipes out there. To lighten them up (and make them dairy free!) I swapped the butter for coconut oil and the buttermilk for Silk cashew milk! Whipped egg whites add volume to the batter and keep it tender, so there’s no need for sour cream. Then came the difficult decision of that to frost them with? I couldn’t decide between brown sugar buttercream, whipped mocha ganache, or peanut butter frosting. The crowd on facebook was just as indecisive as I was: the vote was just about tied between brown sugar and peanut butter. I ended up opting for a dairy-free version of the brown sugar buttercream that I originally used on my baked chocolate pumpkin donuts and I was very happy with my decision. They frosting is delicious, but doesn’t distract from the cake itself. Enjoy your cupcake with a cold glass of Silk cashew milk! It’s a lot easier to find now than it was back when I first used it in my cashew-chai French toast casserole and I’ve been keeping it around because it’s awesome in coffee. It’s rich and creamy in a way that most other non-dairy milks aren’t. The creaminess reminds me of 2% milk, but the unsweetened version only has 25 calories per serving. it also makes a great swap for dairy milk in recipes like these cupcakes, raspberry oatmeal pancakes, or smoothies. 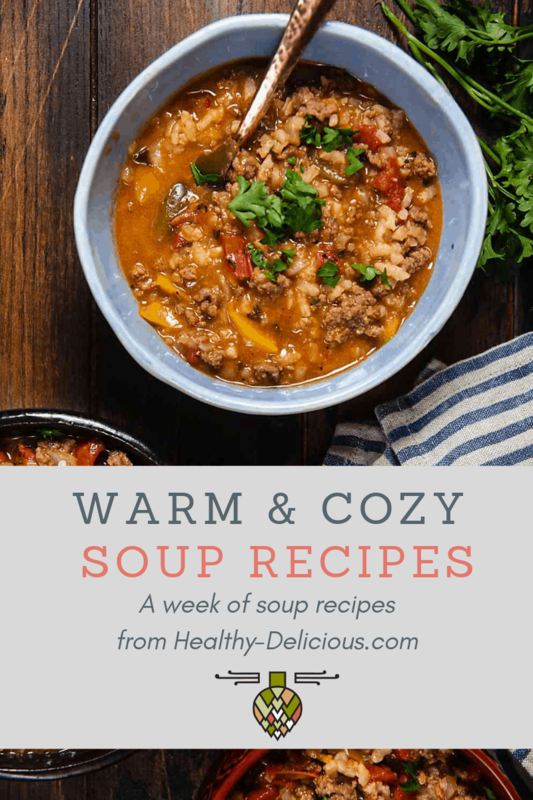 Sign up for the Silk newsletter for more recipe ideas! Heat oven to 350ºF. Line a 12-cup muffin tin with paper liners. In a large mixing bowl, use an electric beater to beat the egg white until soft peaks form. Set aside. In a second mixing bowl, cream together the coconut oil and sugar until it resembles fine, wet sand. Beat in the egg yolk. Stir in the bananas, cashew milk, and vanilla. Whisk together the flour, baking powder, baking soda, and salt. Beat the dry ingredients into the wet ingredients to make a thick batter; gently fold in the whipped egg white. Divide the batter among the prepared muffin cups. Bake for 18-22 minutes or until the tops of the cupcakes are gently domed and light golden brown. While the cupcakes cool, prepare the frosting: Use an electric mixer to beat the shortening until it's light and creamy. Add the sugars and vanilla and beat until the frosting is light and fluffy. If desired, beat in up to two teaspoons of cashew milk to thin out the frosting. Frost cupcakes after they've completely cooled. I was thoroughly impressed by this recipe. I do a lot of gluten free/diary free baking and not once have I found an online recipe this good. I only needed the buttercream frosting so apologize for being incomplete in my review. But the frosting did not work for me. It tasted too strongly of shortening (I used Spectrum) and the brown sugar was too grainy. I have tossed it and am trying a recipe with only powdered sugar and a combo of shortening and Earth Balance. Thank for posting. Does the vegetable shortening hold up? Or does it melt? Should they be refrigerated before serving? 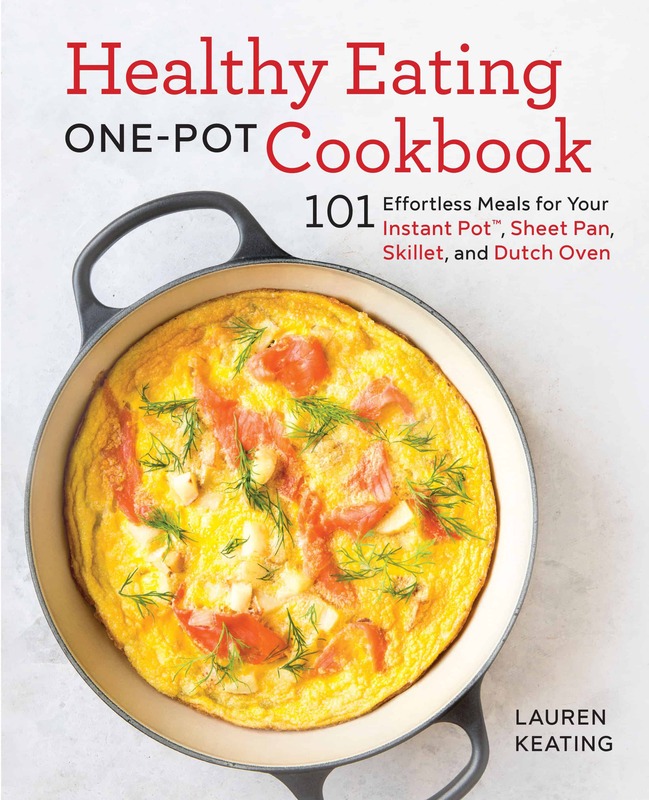 Okay- Time for an unbiased review from someone who actually made the recipe (me)! These are DELICIOUS. They are surprisingly light and fluffy and super well balanced. I’ve never used cashew milk before but I thought I’d give this recipe a shot because I have been craving banana cake ever since I recently attended a wedding where it was served as the main dessert (dairy free as well). I thought I needed to double the icing recipe, but after eating a few cupcakes I see how less is more (However, I substituted butter here because I forgot to buy the shortening! I think I would still feel the same way with the exact recipe). I will absolutely make these again. Next time I plan on playing with the recipe a bit- adding a TINY bit of cinnamon and allspice to the batter and a pinch of salt to the icing. What else I can use instead of cashew milk? We don’t have here any. Thanks. Any dairy free milk (soy, almond, etc) should work fine. Lisa- 1/3 cup coconut oil. I’m not sure why it’s showi up as a square – what browser are you using? Can’t see your reply, can you please post it as a separate comment? These look so good, and definitely think the brown sugar buttercream is the perfect selection! These are SOOOO pretty! My lactose-intolerant hubby would love these. And cashew milk sounds delicious! These look fantastic! My son has a daycare classmate with a milk allergy, and when I make treats for the class, I like to make them dairy-free so everyone can enjoy them. Thanks for the recipe! ooo banana cake… banana bread…I crave it all the time! mmm and under 300 calories a piece, that works perfectly for me! Yes, one hundred times yes! We are huge banana…well anything fans in our house. These are perfect! Your choice of icing is what i would have went with as well…and I would have licked the bowl clean! These cupcakes look awesome! I’m still trying to get my hands on some of that cashew milk and when I do I want to make this recipe. Yum! I haven’t worked with cashew milk before but this recipe makes me want to try! So tasty and pretty! Oh, nice – I love that you used cashew milk in these. I was craving banana cake and made some today, but I could still eat one of these beauties! I too have been loving using Silk cashew milk! It’s so thick and creamy perfect for baked goodies like these cupcakes, wow and yum!! I’ve never tried cashew milk but I’d love to give it a try! And banana cake cravings in December? That’s kind of funny. 🙂 I’m happy you finally got that craving taken care of with these gorgeous cupcakes! It’s been ages since I’ve made banana bread or cupcakes, but suddenly I have a craving! These are some of the pretties cupcakes I’ve seen in awhile. Love Silk cashewmilk and what beautiful cupcakes. The frosting sounds perfect. These look amazing, I’m ready to take a giant bite of that frosting too! Ha! I haven’t tried cashew milk yet but since I’m obsessed with anything cashew I’m pretty sure I’d love it. I love that cashew milk – and I love these cupcakes too! These looks so moist and delicious! 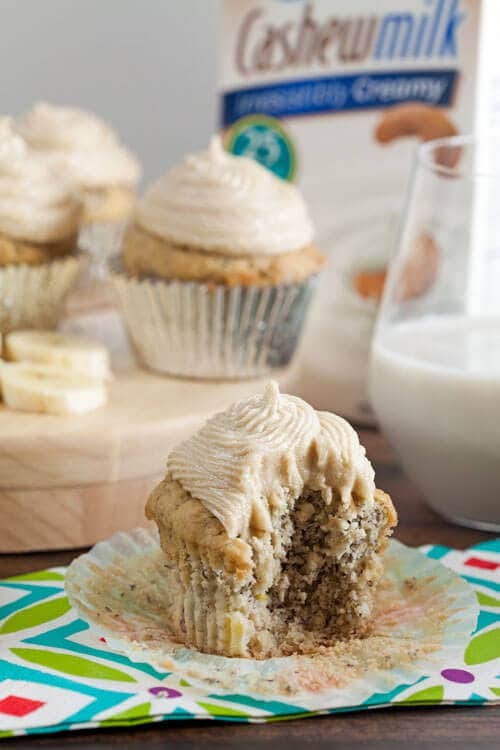 I haven’t tried cashew milk yet but I definitely will when I make these cupcakes! These look so delicious!! And I just can’t stop giggling over the “eggs are dairy”. Goodness. I use to be a chicken judger in FFA, so it’s super hilarious. I had no idea people thought that! OMG!!! Bingo for a great looking cupcake. I particularly like the frosting! I’m adding this to my recipe box! Holy cow these look good! Give in to the cravings! I could eat the brown sugar buttercream on just about anything. And I appreciate the dairy free option when cooking for someone with lactose intolerance! We’ve tried almond milk for some things, haven’t tried cashew milk yet. Yes, I get daily cravings for chocolate 🙂 I do love banana cake and these look awesome. That frosting!!! These are gorgeous! I have not tried cashew milk yet and use almond mostly. However, I’m going to be looking for it in the store now….thanks. Those look yummy, but they are not dairy-free!! The recipe has an egg. You could make them dairy-free if you use a flax egg or egg-replacer though. Eggs aren’t dairy. I know it’s a common misconception since they’re often sold right next to the milk, but dairy only related to milk products. I think you are confusing “vegan” with “dairy-free”. Dairy comes from cows and eggs come from chickens. So regardless of the eggs in the recipe, as long as it contains no butter, milk, cheese or cream, it is indeed dairy-free.